Botany needs help from the tropics. Its big plants will engender big thinking. Our ancestors were tree dwellers. Throughout human history, people have taken to the trees as safe havens, sites of special spiritual connection, and a cornucopia for food, medicines, materials, and productivity (reviewed in Lowman 1999, Nadkarni 2008). In many tropical forest regions, indigenous people rely on forests for their livelihoods. Increasingly at a global scale, people and governments are beginning to recognize the importance of ecosystem services provided by forests, which link directly to human health (Perrings et al. 2010). Such benefits include medicines, foods, shade, building materials, gas exchange capabilities, energy production, carbon storage, genetic library, water cycles, and spiritual/cultural heritages. In many religions, forests are an integral stewardship of the clergy (e.g. Bossart et al. 2006; Wassie-Eshete 2007; Lowman 2010). Children in many cultures climb trees for recreation and build tree-houses as an important component of their creative and spiritual links to nature (Louv 2005). With their billions of green leaves that produce sugars from sunlight, the treetops are the engines that support life and the basis of food chains throughout the planet. In an evolutionary sense, humans descended from ancestors in the treetops. Recent findings about ancient hominoids in Ethiopia indicate that human ancestors inhabited forests (not savannahs as was previously thought) (White et al. 2009). Anyone who pauses at the zoo to watch a monkey cavorting in tree branches is amused, inspired, and subconsciously reminded of some arboreal sensation that tugs on our evolutionary memory banks. In Papua New Guinea, a tribe called the Korowai still lives in the treetops, erecting amazing aerial houses accessible by twig ladders. It is speculated that their unusual habit of community tree houses evolved as a mechanism to escape enemies on the forest floor, and provide a healthy environment above the dank, dark understory. Tree houses remain a recreational vestige of children and adults alike that inspire links between humans, their ancestry, and the natural world. Many famous people have escaped to childhood tree houses - John Lennon (of the Beatles), Winston Churchill, the Roman Emperor Caligula, and Queen Victoria when she was a young princess (Nelson et al. 2000). Recent medical findings indicate that children who play outdoors and learn about nature have better health and well-being (Louv 2005, Lowman, D'Avanzo, and Brewer 2009). Why do the treetops hold such a spiritual, as well as scientific importance for cultures throughout the world? And why have scientists only recently undertaken to explore these heights for scientific discovery, after decades of studying a mere fraction of the forest understory? Relatively few unknown frontiers of exploration still exist in the twenty-first century, but the treetops are still considered a "black box" in science (Lowman 1999). The other "black boxes" for exploration include the ocean floor and soil ecosystems. Forest canopies reputably house over 40% of the biodiversity of terrestrial ecosystems (reviewed in Wilson 1992; Lowman and Rinker 2004). The combination of sunlight, fruits, flowers, and year-round productivity of the foliage in tropical rain forests provide ideal conditions for an enormous diversity of inhabitants. Thousands of species of trees and vines produce a veritable salad bar for millions of insects that are in turn eaten by myriad reptiles, amphibians, birds and mammals; and those primary consumers are eaten by secondary consumers such as harpy eagles, jaguars, and other carnivores. Finally, the cycle of life is completed when soil decomposers break down and recycle all matter for uptake of component nutrients into the canopy (Frost and Hunter 2007). In addition to classic food chains using energy from sunlight to cycle water and nutrients through leaves to herbivores to carnivores/omnivores to decomposers and back to plants, forests house extra niches for other unique forms of life. Bromeliad tanks, tree crotches, leaf surfaces, and epiphyte communities host extra layers of life in forest canopies. For example, bromeliad tanks house virtual swimming pools in the sky that are home to an entire microcosm of micro-organisms. Mosquito larvae, nematodes, tarantulas, katydids, shovel-tailed lizards, and canopy mammals live in and/or drink from these aerial watering holes. Some poison dart frogs trek all the way from the forest floor into emergent trees to deposit their eggs in phytotelms. Other unique canopy niches include the crotches of trees which provide germination sites for strangler figs, and soil repositories that house many micro-arthropods usually associated with the forest floor. Strangler figs are the only tree known to start life "at the top" and send their aerial roots extending downward, eventually penetrating the soil below to expand and strangle their unwitting host plants. Epiphytes add an extra layer of biodiversity and productivity in the moist, sun-flecked branches. Even more amazing, the surfaces of canopy leaves provide substrate for epiphylly, another extra layer of plant forms including lichens, mosses, and fungi, many of which grow exclusively on leaf surfaces. Within the "canopies" of these tiny epiphylls live an entire microcosm of micro-invertebrates and other microscopic organisms. Nothing rivals the forest canopy in terms of biodiversity - layers upon layers of life, all nurtured by sunlight, moisture, and warmth in a unique combination that fosters an extraordinary diversity and abundance of species. This world of canopy plants, insects, birds, mammals, and their interactions remained relatively unknown and out-of-reach to scientists until as recently as twenty-five years ago (reviewed in Lowman 2004). William Beebe first introduced the world to the wonders of tropical rain forest canopies with his popular book, High Jungle (1949), in which he described using bow and arrow or climbers to hoist rope ladders into the high canopy. Field ecologists first used slingshots to propel ropes into the treetops in the late 1970s, but no one yet recognized that this green umbrella overhead was a critical component of global health. Exploration of both undersea and outer space was relatively commonplace prior to the exploration of forest canopies. But with the recent escalation of climate change and population pressures, canopies have become a proverbial "canary in the coal mine", since their declining health is a harbinger of environmental changes on a global scale, as well as a driver of further change (Foley et al. 2003, Janssen et al. 2008). Currently, forest canopy scientists - along with reef ecologists, ice physicists, soil biologists, water chemists, and others - are taking on the role of planetary physicians, working against a near-impossible timeline in hopes of unraveling the critical mysteries of how our planet functions. With access into forest canopies, our knowledge of the machinery of forest ecosystems has greatly expanded. And perhaps less appreciated in a technical sense, forest canopies enhance our sense of wonder and appreciation of the natural world, serving as drivers for more ambitious conservation agendas. B. Why Such a Time Lag in Studying Forest Canopies? "Overhead, at a height, perhaps, of a hundred feet, is an almost unbroken canopy of foliage formed by the meeting together of these great trees and their interlacing branches; and this canopy is usually so dense that but an indistinct glimmer of the sky is to be seen, and even the intense tropical sunlight only penetrates to the ground subdued and broken up into scattered fragments...it is a world in which man seems an intruder, and where he feels overwhelmed." Delight itself...is a weak term to express the feelings of a naturalist who, for the first time, has wandered by himself in a Brazilian forest. The elegance of the grasses, the novelty of the parasitical plants, the beauty of the flowers, the glossy green of the foliage, but above all the general luxuriance of the vegetation, filled me with admiration. A most paradoxical mixture of sound and silence pervades the shady parts of the wood. The noise from the insects is so loud, that it may be heard even in a vessel anchored several hundred yards from the shore; yet within the recesses of the forests a universal silence appears to reign. To a person fond of natural history, such a day as this brings with it a deeper pleasure than he can ever hope to experience again." (Darwin 1883). Ideas about forest canopies changed very little for almost a hundred years from Darwin's day until the 1950s, when a steel tower was constructed in Mpanga Forest Reserve in Uganda to study gradients from the forest floor to the canopy. Towers provided access to monitor insect vectors of human diseases, representing one of the first applied biological studies conducted in the forest canopy (Haddow et al. 1961). Other early canopy studies were mainly exploratory by nature: Operation Drake by Andrew Mitchell through the Oxford University explorers club, the first canopy walkway structure in Malaysia anchored among tree crowns (Muul and Liat 1970); ladders affixed to observe tree phenology and animal visitors (McClure 1966); Bawa's early chromosomal cytology of canopy trees in the Himalayas (Mehra and Bawa 1968, 1969); and Steve Sutton's early exploration of Sulawasi (Sutton 2001). All of these early canopy pioneers utilized methods that were relatively inexpensive and designed as creative solutions to overcome the challenges of gravity, but were not necessarily devised to be easily replicated for experimental design purposes or for multiple users. The late 1970s represented a golden age of canopy access, with development in 1978 of single rope techniques (SRT), independently designed for ecological data collection by Lowman (1983) in Australia and Perry (1986) in Costa Rica. Whereas SCUBA equipment in the 1950s heralded the age of exploration for coral reefs (reviewed in Sale 2002), ropes and harnesses inspired the "race to the top" (of trees). This versatile toolkit of ropes, harness, and climbing hardware enabled scientists to reach the mid-canopy with ease, suspended from a rope to observe pollinators, epiphytes, herbivores, birds, monkeys, and even sloths. Portable and relatively inexpensive, SRT and DRT (double rope techniques) allowed even budget-limited graduate students to survey life in the treetops (reviewed in Mitchell et al. 2002). Ropes were ineffective, however, to reach the leafy perimeters of tree crowns, since the ropes had to be looped over sturdy branches usually close to the tree trunk. To access the uppermost foliage of canopy trees, new devices were invented to overcome earlier limitations. For example, botanists in Indonesia devised the canopy boom, a horizontal bar with a bosun's chair at one end, which could be swung around the leafy canopy away from the woody trunks (Peter Ashton, pers. comm.). In Pasoh, Malaysia, a combination of ladders, ropes, and booms launched research that solved the mystery of the pollination of dipterocarp flowers (Appanah and Chan 1981). Bawa (1969) used scaffolds and ropes to study pollinators in tropical trees in India. In temperate forests with their lower canopies, Lowman and Ashton adapted construction scaffolding to survey the leafing phenology of birch trees in Scotland (Lowman 1978). Engineers and creative canopy biologists partnered to construct canopy bridges and platforms in the 1980s. The first two canopy walkways were constructed nearly simultaneously: one in Malaysia anchored in tree crowns by Ilaar Muul, and another in Queensland, Australia supported by telephone poles (see Lowman 2009). Built in Lamington National Park, the Australian walkway was a collaboration of ideas of Lowman and Peter O'Reilly, owner of the ecotourist lodge called O'Reillys Guesthouse. Lowman's Earthwatch programs in Queensland rain forests required a canopy access tool that held groups of researchers (since ropes are solo operations). More than five years after the walkway construction in Australia and Malaysia, North America's first canopy walkway was built in 1992 using a suspension bridge construction design suspended between oak trees in Massachusetts (Lowman and Bouricius 1995); and America's first public canopy walkway was constructed among in Florida oak-palm hammocks in Myakka River State Park in Florida in 2000 (Lowman et al. 2006). Canopy walkways have since been replicated throughout the world, using a modular construction design developed by Canopy Construction Associates (www.canopyaccess.com ), Greenheart, and a few other companies. Throughout the last decade, canopy walkways and ladders used in conjunction with climbing ropes, zip lines, and other tools have become popular ecotourism destinations as well as research tools (see also www.treefoundation.org). Subsequently, canopy walkways can provide sustainable income to local people, especially useful in tropical rain forests because it provides an economy different from logging (Lowman 2009). Perhaps one of the most creative canopy access tools is the French-designed hot-air balloon, called "Radeau des Cimes" (translation: raft on the rooftop of the world). The balloon flies independently but also operates in conjunction with an inflatable raft (27 meters in diameter) that can be set on top of the canopy surface to serve as a base camp or platform atop the uppermost branches of tall trees (Halle and Blanc 1990). In 1994, the Radeau des Cimes expedition team pioneered a new technique in French Guinea called the sled, or skimmer. This small (5 meter across) equilateral, triangular mini-raft was towed across the canopy by the dirigible, similar to a boat with a trawling apparatus in the water column. The sled allowed rapid exploration between trees to compare pollinators, photosynthesis, herbivores, and relative diversity/abundance of canopy life. Construction cranes represent the most recent tool for safe access into the forest canopy (reviewed in Mitchell et al. 2002). In 1990, the Smithsonian Tropical Research Institute first erected a 40-m- long crane in a Panamanian seasonally dry forest; since then, ten other crane operations have commenced operation in Australia, Switzerland, Germany, Japan, Indonesia, the United States, and Venezuela. Cranes are expensive to install and operate (usually ranging from US $1 to $5 million), but offer unparalleled, repeated access to the uppermost canopy within reach of the crane arm. The forest canopy is defined as "the top layer of a forest or wooded ecosystem consisting of overlapping leaves and branches of trees, shrubs, or both." (Parker 1995). Tree canopies represent the hotspots of the forest -new leaves, flowers, pollinators, birds, arboreal mammals, orchids, lizards, mosses, and millions of insects. The bulk of energy captured from sunlight is concentrated in this region high above the forest floor. Oxygen is just one of the by-products of this canopy engine that represents the interface of earth and atmosphere. Studies of plant canopies typically include four organizational levels of approach: individual organs (leaves, stems, or branches); the whole plant; the entire stand; and the forest landscape. Canopy biology represents a relatively new discipline of forest science only formally launched over the past three decades (albeit linked inextricably as part of whole-forest biology). Canopy science incorporates the study of mobile and sessile treetop organisms and the processes that link them to the larger ecological forest ecosystem. Studying mobile bird populations is dramatically different in methods, tools, and temporal dynamics from studying sessile lichens anchored to leaf or bark surfaces. With the recent urgency surrounding climate change research, forest canopies have emerged as an important interface between earth and atmosphere; episodes such as insect outbreaks or canopy species extinctions serve as early warning signals indicative of hotter, drier climates. Access to forest canopies has led to the discovery of millions of species inhabiting this above-ground world. Quite by chance, Dr. Terry Erwin of the Smithsonian Institution first discovered the abundance of life in the treetops. Erwin sprayed several tree canopies in the tropics with a mild insecticide, and an astounding diversity of arthropod residents fell to the ground in a heap, enabling him to count and catalogue them (Erwin 1982). From this initial harvest of insects in Panamanian rain forest trees, Erwin extrapolated that there may be 30 million species on our planet, not 1-2 million as previously estimated. Since that time, studies by other canopy biologists in Australia, Indonesia, and Peru confirmed Erwin's predictions that millions of insects inhabit forest canopies. Field biologists who focus on biodiversity seek to catalog, identify, and understand the role of all creatures on Earth. This is not simply a naming game; its ultimate purpose is to understand the structure and function of an ecosystem, almost the same way that we seek to know how the components of a car engine operate together to create an efficient machine. The challenge to discover and identify species throughout the world is not easy. Finding a new beetle in the treetops is akin to locating the proverbial needle in the haystack --- ninety percent perspiration and ten percent luck. All organisms collectively -- orchids, beetles, birds, vines, frogs, and many others -- constitute biodiversity, otherwise known as the variety of species on Earth. The word "biodiversity" has become politically and scientifically important over the past two decades, as human activities have accelerated ecosystem degradation and subsequent loss of species throughout the world. Long before Erwin, naturalist Charles Darwin in the 1800s estimated that approximately eight hundred thousand species inhabited the Earth. (One can only imagine that the Queen of England was most impressed by his scientific prowess in calculating this apparently enormous number!) Nearly one hundred years later, Erwin's canopy fogging data raised Darwin's original tally more than forty-fold. As a result, scientists now believe that the treetops are home to a large proportion of biodiversity on the planet. Only the soil microcosm is predicted to exceed canopy biodiversity, but biologists have not yet learned how to accurately measure organisms underfoot. Professor Edward O. Wilson, eminent biologist at Harvard University, speculated that as many as 100 million species may inhabit our Earth based upon initial surveys of the canopy, soil, and oceanic biodiversity combined (May 2010). Many canopy species provide essential ecosystem services upon which human beings depend for survival. In the Amazon, plants produce chemical defenses against insect attack; and these chemicals, in turn, are used by indigenous cultures for medicinal purposes. The shaman (or medicine man) is a highly respected community leader, who has inherited generations of knowledge about the practice of using plants for medicinal purposes. Canopy leaves, barks, and fruits provide a veritable apothecary in the sky, all of which have evolved over time due to the unique interactions of plants with their herbivores (mostly insects!). Canopies not only provide medicines, but also foods, industrial compounds and construction materials, and serve as reservoirs providing for soil conservation, genetic libraries, carbon storage and fresh water conservation. Additional ecosystem services, which are the subject of extensive recent research, include gas exchange, energy production, climate control, and cultural/spiritual sanctuaries for many people (reviewed in Lowman 2009, Schowalter 2011, White et al. 2010). The tools and discoveries of canopy biology burgeoned in the 1980s, and subsequent quantitative and experimental fieldwork expanded in the 1990s. Analogous to the three-dimensionality and complexity of coral reef research (see Sale 2002), but building on the rigorous experimental design of two-dimensional intertidal ecology (see Murray et al. 2006), canopy biology has experienced a dramatic evolution in its short history from pure exploration and a sense of wonder, to increasingly quantitative approaches, and currently embracing an tremendous urgency to protect forests and their critical canopy functions (not just data collection) before they disappear. Over these past three decades, the role of canopy biologists has changed. No longer can scientists dangle leisurely from the trees and contemplate the beauty of harpy eagles and katydids; instead, they are caught up in an urgent race against time to provide answers to critical questions about canopy effects on climate before the potential effects of deforestation are ensured. To date, only 1.7 million of an estimated 30 (or perhaps 100?) million species have been identified. At their current rate, taxonomists classify approximately 7,000 new species per year, an agonizingly slow page compared to the threats of deforestation. The effort of sorting, counting, and naming as many as one hundred million species is daunting. The ecological task of determining which species are most important to forest health is even more challenging. As Stewart Udall, former U.S. Secretary of the Interior once said, "Over the long haul of life on this planet, it is the ecologists, and not the bookkeepers of business, who are the ultimate accountants." How many is 100,000,000 species? Is there a way to make that enormous number more meaningful for non-mathematicians? If 200 scientists discovered and identified one new species every day for the rest of their lives, they would need nearly 1,500 years, including weekends and holidays, to complete their task of identifying the estimated biodiversity on Earth (Lowman et al. 2006). Even more urgent than names alone, biologists need to determine benchmarks for evaluating changes in forest canopy conditions and effects on Earth's environment. Is biodiversity important? And do we care if some species become extinct? How much forest and which tree species are critical to maintain this global machinery that we call a forest ecosystem? Can forests function in fragments, and will they remain healthy if replanted in single- species plantations? Unfortunately, no one has answers to these important questions. Biologists have not studied forest canopies long enough to understand the processes that are critical to their health. In the wisdom of Sand County Almanac (1949), world-renowned ecologist Aldo Leopold said, "To save every cog and wheel is the first precaution of intelligent tinkering." Another famous scientist, Paul Ehrlich, considered biodiversity analogous to the mechanical parts of an airplane. He speculated that, if an airplane mechanic continued to remove nuts and bolts from a plane, the machine will eventually cease to fly. Similarly, as species disappear, we may find that our ecosystems can no longer "fly", i.e., support life (Head and Heinzman 1990; Meadows 1991) The critical question asked most often still remains: Will such extinctions reach a critical threshold beyond which humans cannot exist? Over sixty years later, Leopold's words hold true today. We need to preserve all the pieces of ecosystems (i.e., species) until we identify which ones are essential to the operation of the machinery. Forest canopies represent "home" to a disproportionately large number of species. Because forests are such efficient machines producing energy, medicines, materials, fibers, foods, nutrient cycling, and atmospheric gases critical to all life on Earth, the continued health of forests is directly intertwined with human health. Since researchers first observed canopy pollinators in the 1960s and the first canopy walkways were built more than 20 years ago, millions of hectares of tropical rain forest have disappeared, along with thousands of as-yet-undiscovered new species. Loss of forest canopies is a critical issue for our children and their children, as they grow up to inherit the stewardship of our planet. Earth is full of exciting discoveries relating to forest canopies - new medicines, exotic perfumes, ecosystem services such as fresh water supply and carbon sequestration, keystone predators and other food chain dynamics, and important economic products such as chocolate, corn, oranges, coffee, and rubber, to name but a few. The next decade is critical. Forest canopies are essential to healthy ecosystems that translate into sound economic policies. 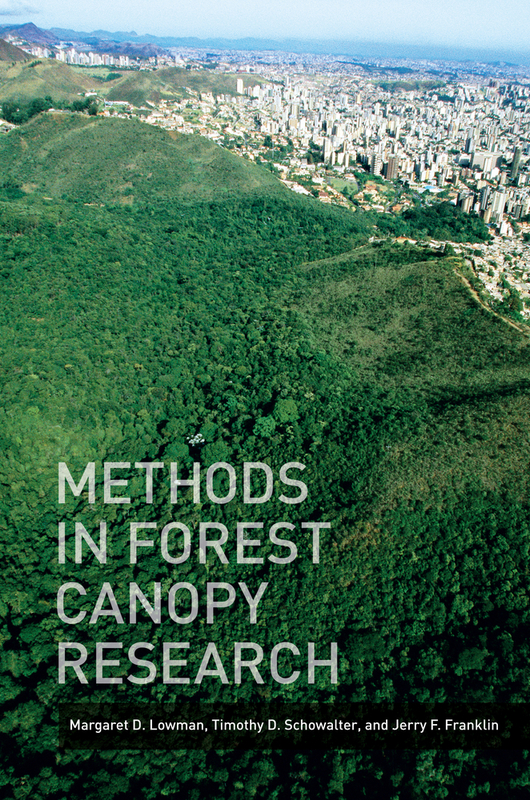 This book is organized to facilitate selection of appropriate methods for particular canopy research objectives. Chapter 2 describes methods appropriate for comparing canopy variables among forest types. 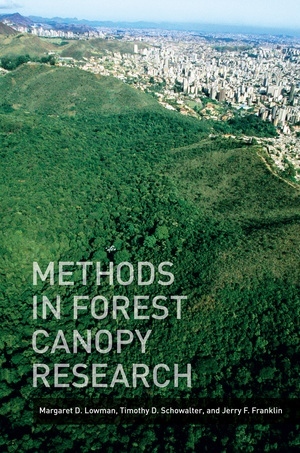 Chapter 3 describes methods for accessing forest canopies within particular sites. Chapter 4 describes methods for describing the structure of tree crowns and forest canopies. Chapter 5 describes methods for describing habitat diversity and measuring the abundances and distribution of canopy organisms, as well as canopy processes. Chapter 6 describes methods for measuring canopy-atmosphere interactions, and Chapter 7 describes methods for measuring canopy-forest floor interactions. Finally, Chapter 8 describes application of canopy biology to the design of canopy conservation and education programs. Throughout the book, our objective has been to provide an overview of available methods and their advantages and disadvantages for particular research objectives. We do not intend to recommend particular methods, given that selection of methods must be consistent with particular research objectives. However, we encourage collaboration among canopy researchers and selection of common methods that will facilitate comparison of canopy variables among regions and forest types in order to advance canopy science globally. Poised between soil and sky, forest canopies represent a critical point of exchange between the atmosphere and the earth, yet until recently, they remained a largely unexplored frontier. For a long time, problems with access and the lack of tools and methods suitable for monitoring these complex bioscapes made canopy analysis extremely difficult. Fortunately, canopy research has advanced dramatically in recent decades. Methods in Forest Canopy Research is a comprehensive overview of these developments for explorers of this astonishing environment. The authors describe methods for reaching the canopy and the best ways to measure how the canopy, atmosphere, and forest floor interact. They address how to replicate experiments in challenging environments and lay the groundwork for creating standardized measurements in the canopy—essential tools for for understanding our changing world. Margaret D. Lowman is Director of the Nature Research Center at the North Carolina Museum of Natural Sciences and Research Professor at North Carolina State University. Timothy Schowalter is Professor and Department Head in the Department of Entomology at Louisiana State University Agricultural Center. Jerry F. Franklin is Professor of Ecosystem Analysis in the College of Forest Resources at the University of Washington.